↑ "Mamnoon Hussain most likely to replace Zardari". The News. 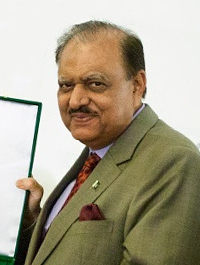 21 July 2013. http://www.thenews.com.pk/Todays-News-13-24274-Mamnoon-Hussain-most-likely-to-replace-Zardari. Retrieved 23 July 2013. هيءُ صفحو آخري ڀيرو 08:50، 11 سيپٽمبر 2018ع تي ترميميو ويو هو.